As Sisters grows and more housing and businesses are constructed, the native ponderosas that are "in the way" must be cut down, sometimes leaving remaining pondos vulnerable to high winds. Disturbance and compacting of the soil around the trees during construction, and installation of asphalt and concrete surfaces, can lead to eventual weakness in the trees, opening the pines up to insect infestations and disease, often resulting in dead trees. 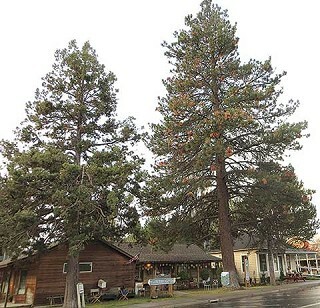 Those who are fortunate enough to have ponderosa pine trees on their property would be well-served to educate themselves on the "care and feeding" of these local giants, to ensure they remain healthy, rather than becoming a danger to life and homes. The ponderosa pine has a very long taproot, which anchors it well into the ground, roots that can spread out 100 feet from the tree, and resistance to fire provided by the thick bark of the tree. To care for ponderosas growing on private property, don't overwater but provide adequate water to avoid stressing the trees during dry periods. Prune out dead limbs. Watch for any pitch oozing from a wound or crack. Look for bore holes or frass (sawdust) from beetles in the bark. Approximately 200 insect species can affect ponderosa pines from cone stage to maturity. Pinecone beetles cause tree death by transmitting blue stain fungus to the tree. Their larvae also consume the phloem, restricting the flow of nutrients to the top of the tree. Western pine beetle is a common cause of death for older trees, drought-stressed trees, and even healthy, vigorous trees during epidemics. Bark beetles are naturally present in all stands, and if there is a lot of slash lying around the bark beetle population can explode and kill vigorous trees. Dwarf mistletoe is the most widespread parasite that causes branch and stem deformation. It germinates on ponderosa pine branches and forces its roots into the phloem, creating stem cankers that leave the wood weak, making it susceptible to fungal infections and insect attacks. Root diseases, rusts, trunk decays, and needle and twig blights also cause significant damage. Be on the lookout for forked tops that may split or limbs that are only partially attached to the tree. One of America's most abundant tree species, the ponderosa pine is native to western North America, from central British Columbia south to central Mexico, from the Pacific Northwest and California to South Dakota's Black Hills and Utah's Bryce Canyon, covering approximately 27 million acres of land. When searching for the Northwest Passage with the Corps of Discovery, Meriwether Lewis collected and described "the long-leafed pine" but the specimens didn't survive the journey. Scottish botanist David Douglas rediscovered the ponderosa 25 years later near Spokane and named it Pinus Ponderosa, or ponderosa pine. Ponderosa is the Latin word for "heavy, weighty, or significant" and refers to the impressive size and stature of the trees. The environment and weather conditions in Sisters have made this a favorable location for ponderosas, explaining their historical abundance. Pondos typically grow in semiarid locations (less than 20 inches of annual precipitation), like our high desert, often surrounded by juniper and sage, at 3,000 to 10,000 feet elevation, with a hardiness zone of three to seven. Ponderosas average 100 to 160 feet in height, with some exceeding 200 feet. They range from two to five feet in diameter, with the rate of growth (13 to 24 inches a year) dependent on altitude, soil, temperature, and rainfall. Full sun is the ideal condition for the pondo, getting at least six hours of direct, unfiltered sunlight each day. Once established, ponderosas are highly drought-tolerant, but don't fare well in excessively wet or poorly drained sites. When young, the tree is pyramid-shaped, but gradually loses lower limbs as it grows taller. Mature trees are tall, with a straight, thick trunk and a large, irregular evergreen crown. The flaky bark on a young ponderosa is a thin dark gray to blackish, giving it the nickname "blackjack" because of its dark color (black) and lack of reproductive abilities (jack) until it becomes a cone-bearer after 45 to 60 years. About that same time, the bark becomes reddish, more furrowed, and thicker. As the ponderosa reaches 125 to 150 years of age, the bark becomes reddish-orange to yellow and has split into big plates, smelling like vanilla or butterscotch. The change of color gave rise to the nickname of "yellowbelly." There are some amazing specimens of "yellowbellys," left by the logging companies years ago, along the Fall River near Sunriver. Ponderosa needles are four to eight inches long, in bundles of three. Male cones are orange or yellow and are located in small clusters near the tips of the branches. The more familiar female cone is oval, woody, three to six inches long, with a small prickle at the tip of each scale, usually necessitating gloves when cleaning them up. A large number of our local birds, as well as chipmunks and squirrels, consume the seeds of the ponderosa, found in the cones. Grouse use the needles for nesting materials and small rodents use the bark in their nests. The trees are also important to various birds for cover, roosting, and nesting sites. Ponderosa snags provide nesting and roosting sites to a large number of wild species. The life span of a ponderosa can be 300 to 600 years, with most surviving for about 125 years before they are lost to natural causes such as rot, insect damage, fires, wind, or man-made causes like logging or construction. Last year at Creekside Park, a 300-year-old ponderosa (considered a legacy tree) had to be removed due to extensive decay in the trunk. Looking at the remaining stump, the growth rings are evident. If you suspect that a ponderosa on your property has a problem, contact a certified arborist, the OSU Deschutes County Extension office in Redmond, or the Deschutes County forester for information on what measures to take.